RIO In-Touch Fly Lines Review - No Stretch Core! How to Choose a Trout Line - Fly Fishing from RIO Products on Vimeo.Alright folks, this isn't going to be just another article about fly lines and the materials they are made out of. That would be lame. Instead, let me give you some legit reasons to invest in new gear that will give you a measurable advantage while fishing. Here is my review so we don't waist your time. I absolutely love the new Rio In-Touch fly lines with the new non-stretch connect core. I won't try to dazzle you with a bunch of science. BORING. Go to the Rio website if you need to know what these are made out of. The bottom line is that after fishing these lines (and lots of test casting), I discovered that there is waayyyy more stretch in fly lines than folks realize. My only complaint is that they should have done this sooner. This technology is not that new! The overall control, instantaneous hook setting, mending control, and DURABILITY offered by non-stretch lines is simply better. I don't have anything to complain about and at $89.95 this is a solid deal. The fact that they don't stretch will help the coating last longer, prevents cracking, and the line will wear much better than one that acts like a bungy cord every time you snag a tree or hit the bottom. Easy on that hook set Big Boy! I have heard people say that they have been breaking fish off with non-stretch fly lines. I think that is a good reason to buy a 3 weight rod hahahah! 6 weight and 6X don't jive. I believe there are other reasons they are breaking fish off. 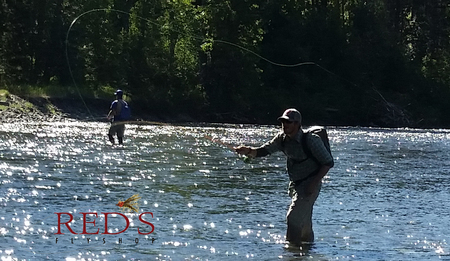 Fly rods have so much flex that the line should not have an impact on whether or not the tippet breaks. This is the only negative that I have heard, but I think the positives regarding instant hook sets are so overwhelming I don't know why everyone wouldn't buy an In-Touch line. Ask ANY experienced guide and they will tell you.... "a good fly line on a crappy rod is better than a crappy fly line on a good rod". Read that a couple of times if you didn't get it. Fly line makes ALL the difference! It delivers the fly, mends, floats (at least it should! ), supports the roll cast, and connects you with the fish. If you haven't had a new fly line in a while it is time. A new fly line is like a clean pair of underwear. You didn't realize how bad your old ones were until you pull on a fresh set. If you are super-duper cheap, at least get some fly line cleaning towelettes and clean your old one. *all the Rio In-Touch Fly Lines have loops on the backing end, this makes installing your own fly line at home super easy! We also ship free and pay any sales tax on all orders! *These 4 lines make up 90% of our floating line sales! On single handed rods, you don't ever need to "over line" your rod. Simply choose the style of line that works best for you and buy the exact line weight. Rio Grand In-Touch Fly Line - This line is approximately one full line weight heavy, i.e. a 5 weight Rio Grand is comparable to a 6 weight Rio Gold. Why? This rod helps make fast action rods easier to cast at short range. This is an amazing line for short quick casts from a drift boat! It also roll casts well. This line will rob performance from medium fast action rods, just sayin'. Rio Perception Fly Line- This line is 1/2 weight heavier than a Rio Gold, i.e. a 5 weight is actually about a 5 1/2 weight line. Why? Same reasons as the Grand, just a bit lighter weight. Rio X-Stream Indicator Fly Line - This line is built for nymph fishing with indicators but actually makes a good Versi-tip System! You can loop to loop sinking leaders or Light MOW tips and make your bobber rod a sink tip rod. Pretty cool idea. This line should be bought right on for line weight. 5 on 5, 6 on 6, etc. What Type of Caster Are You and What Rod is it Going On? There is a good video below done by the great Simon G, but I am going to summarize this in my own set of bullet points because I think I can make it shorter. If you are a beginner and have a rod that is titled "fast action" then a Rio Grand In-Touch Fly Line is probably the right fly line for you. It will make short to moderate range casts feel better and easier to replicate. If you are a beginner to intermediate caster and have a "medium-fast" action rod the Rio Perception Fly Line is a great choice. Advanced casters that are going to be casting at distances beyond 40 -50' on any rod should get a Rio Gold In-Touch Fly Line. If your rod is going to indicator fish most of the time, the Rio X-Stream Indicator Fly Line is an awesome line. Big time mending control for the bobber rig. Great blog with lots of valuable info. Much appreciated. Hi, I am an intermediate fly caster and I am cough in dilemma between the in-touch gold, grand and perception line. I have a 5wt Redington Vapen rod. I am looking for an all-around line but mainly something that will allow me to fight against windy situation and long-distance cast. I am cough in dilemma mainly because I do like the heavier weight of the perception and the grand but I do also like the longer belly of the gold (better for mending, roll cast), what should l do? Some additional info: I use my 5 wt. Vapen mainly for dry fly and nymph fishing situations, I rarely use it for fishing streamers because I have the 6 wt Redington dually switch rod + chucker ling for this application. I don't live anywhere near your shop, however I do appreciate your great videos and articles and would have you as my preferred shop if I was not 800 miles away. Thank you. I have fished a InTouch/ Xtreme Indicator line for two years and love the way it loads and casts. I fish Chironomids under an indicator and like a very straight line with no slack for quick hook sets. I have found that my line gets bends in it and I cannot stretch them out. I believe it is because of the no stretch core. I have tried every thing I know to do and I cannot straighten it out. I am changing back to another brand that I can keep straight.